Yes, I'm Unemployed But I Identiy as Affluent. And Muscular. Can we all admit, this "identify" thing is getting a little out of hand? This is what happens when we send our kids to college and allow the media to educate them about the world. You know, I've been dieting lately and going to the gym. Feeling good. 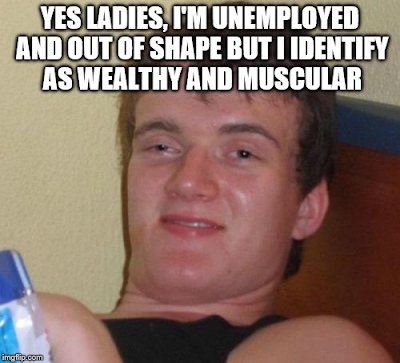 But now I'm thinking what if I just identify as an in shape person? Wouldn't that be good enough? Obviously not, because reality. People have always talked about their being a reality and then everyone has their own internal reality. While that's true, the two can't hold mutually exclusive ideas. At least for long anyway. And this generation is being taught that they can hold whatever truths they want in their mind and that everyone on the outside must believe it or be labeled something terrible like racist, homophobe, anti-something or other. But eventually reality will hit. And then they have to decide whether to simply sink further into their delusions or grow up and accept reality. I thought it was kinda' hilarious in a schadenfreude point and laugh kinda' way. Couldn't help but point out that sometimes reality puts its shoulder to the door and barges in. Even if you're Berkley.